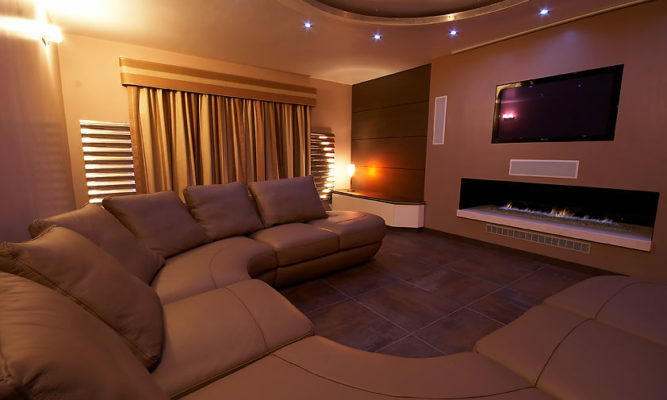 Home cinemas can be installed in a variety of room settings; from purpose built dedicated spaces, to conversion of unused spaces. Multipurpose rooms are also a frequent request for home cinemas, where the room can be utilised for standard TV watching during the daytime, and be converted into a true cinema environment at night. Our client in Wakefield, Yorkshire requested such a multipurpose cinema room to be built with advanced home cinema lighting control in mind. 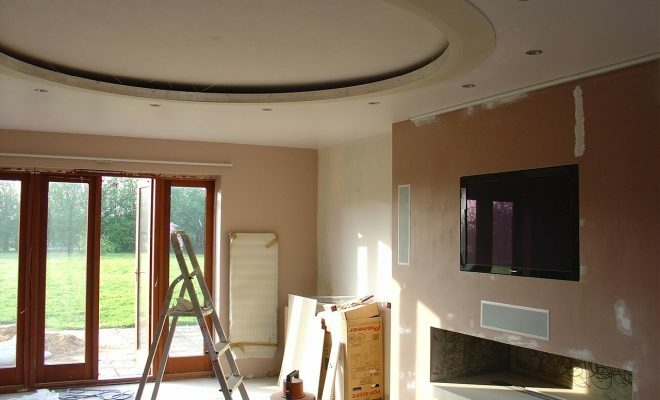 The client demanded a completely discreet cinema solution that would be invisible when not in use. An important requirement was that the room could be used in daytime for standard TV watching, but could then transform into a large screen cinema at the touch of a button. Ease of use, together with high end system performance was a key priority. 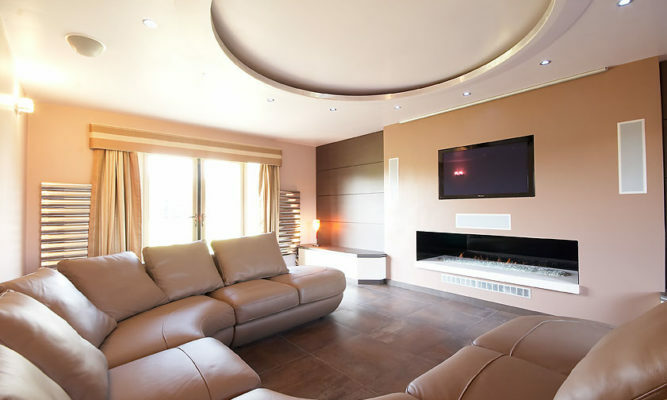 Our client also required all the various home control devices within the room to be controlled via a single remote control. 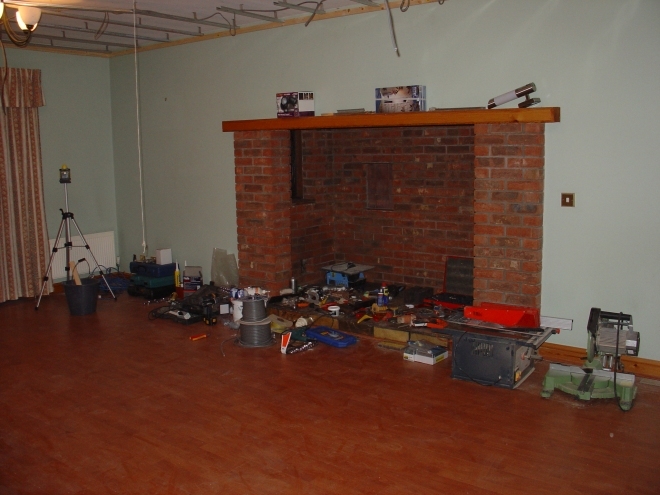 In order to create an eclectic cinema room design, we transformed the walk-in fireplace with a contemporary gas fire. 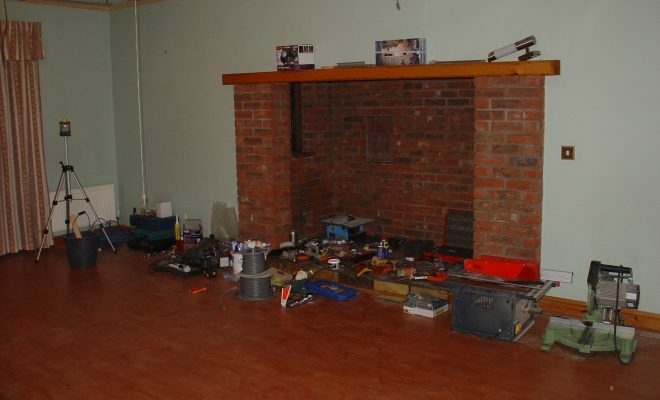 This allowed us to place the TV above the fireplace and recess it completely back into the wall. A clever design of the flume allowed perfect ventilation for the fireplace without damaging the TV with the heat. A 43″ plasma screen by Pioneer features a high gloss piano black bezel, which complements perfectly with the room design. A 7ft dropdown projector screen by Screen Research also sits completely enclosed in the ceiling, out of sight when not in use. Content sources, including the Sky HD service and iDyl movie server was implemented to provide HD content both on the TV and the projector screen. In daytime, the room makes for a luxurious lounge room. 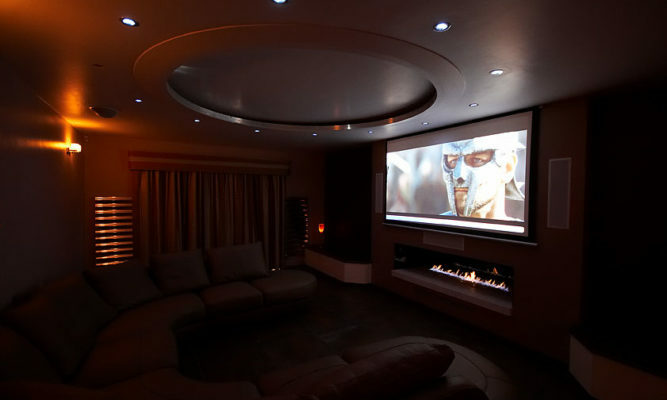 But at night time, with a single button; the screen drops and lights dim to create the perfect cinema room environment with warm lighting and staggering big screen action. In wall speakers by B&W provide sensational quality sound and perfectly match the design of the TV to create an eclectic interior design for the cinema room. 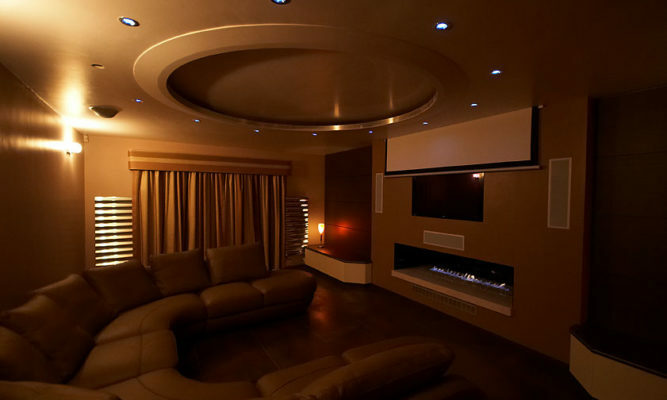 Lighting is an important factor in creating the right atmosphere for the home cinema. To achieve the correct home cinema lighting for this multipurpose room, a number of different types of lighting were used. A six zone lighting control unit offers predefined lighting settings, enabling our client to alter the lighting scenes based on the activity. Fibre Optic lighting was built into the lighting ring in the ceiling, surrounded by a circle of LED spots. Sconces were placed at the back of the room to provide subtle uplighting. Lamps were added on the cabinets at the front for a more ambient lighting effect. Four different scenes were then programmed for “cinema”, “reading”, “relaxing” and “all on” to suit the different uses of the room. A simple to use Nevo SL touch screen remote provides control over the entire system. Thanks to smart programming of the control functions, we were able to create a system that is extremely intuitive. 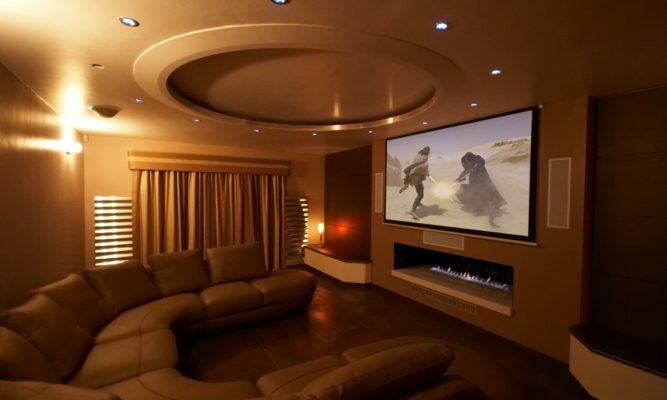 From a single point, it is possible to control the cinema, lighting, gas fire and even curtains. With a single button, it is possible to dim the lights, drop the screen, close the curtains and fire up all the entertainment devices to instantly start enjoying HD content. The cabinet, designed by our client, ensured that everything was kept as discreet and minimalist as possible. All the equipment is completely hidden away when not in use, with the only access required to load new DVDs and CDs onto the media server. A simple infra red pass through allows all the equipment to operate with the cabinet closed without the remote needing a direct line of sight to the equipment. We were able to successfully create a multi-purpose media room environment with an interior design that is both aesthetic and functional. 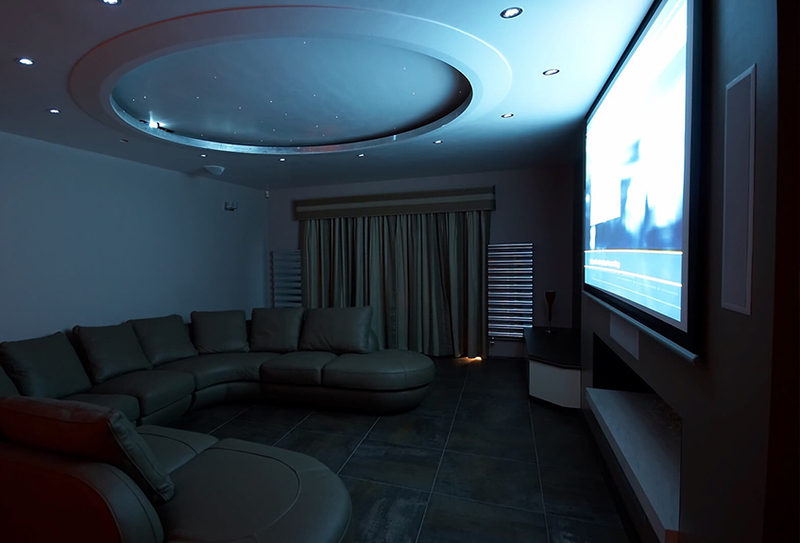 Thanks to clever application of home cinema lighting and correct choice of entertainment options; our client is now able to enjoy his room both as a daily living room and a high-end cinema room with surround speakers.